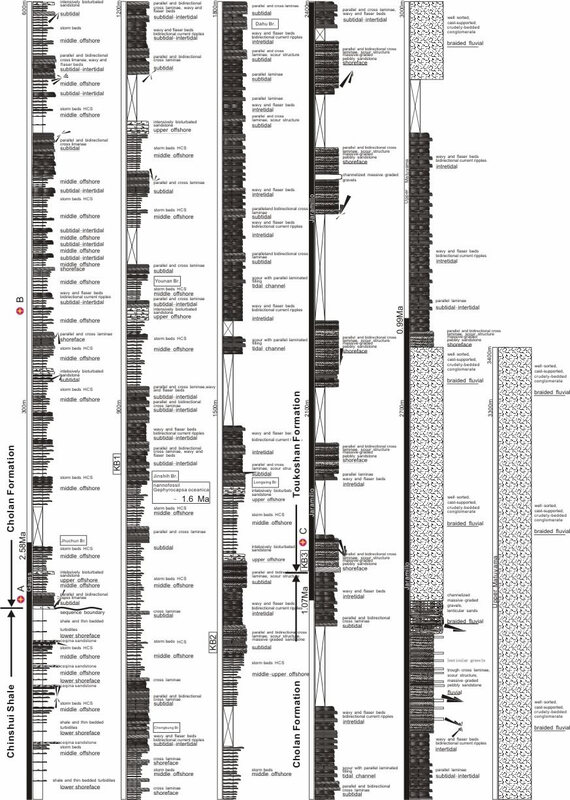 The stratigraphic section (Fig. 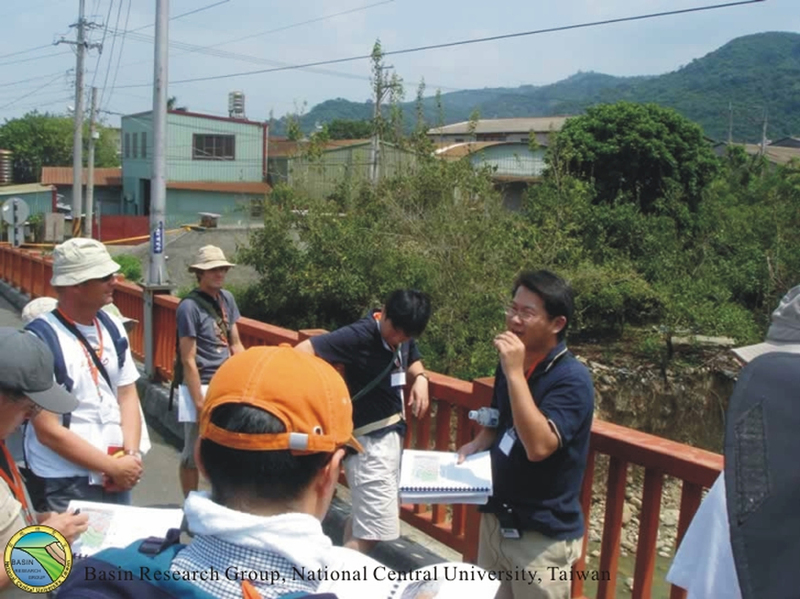 2) exposed along Tsaohu River (Fig. 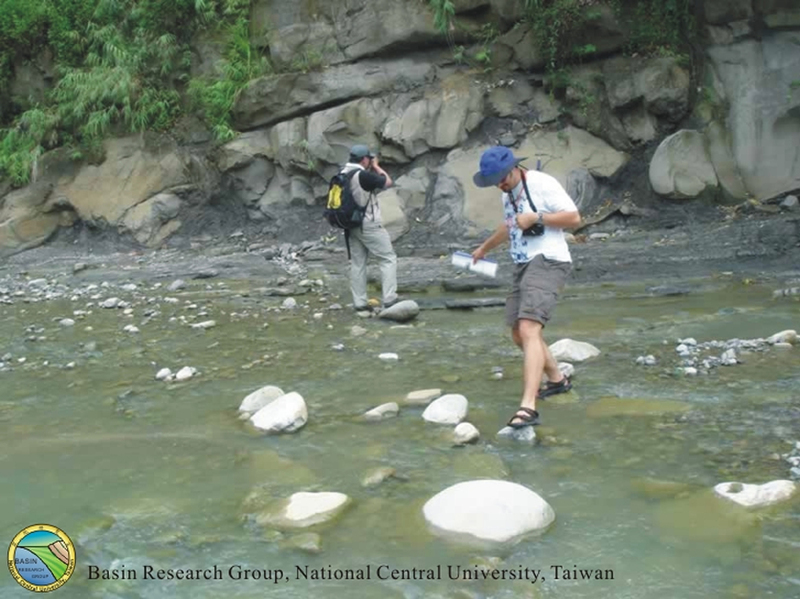 1) locates on the hanging wall of the Chelungpu fault in north-central Taiwan. 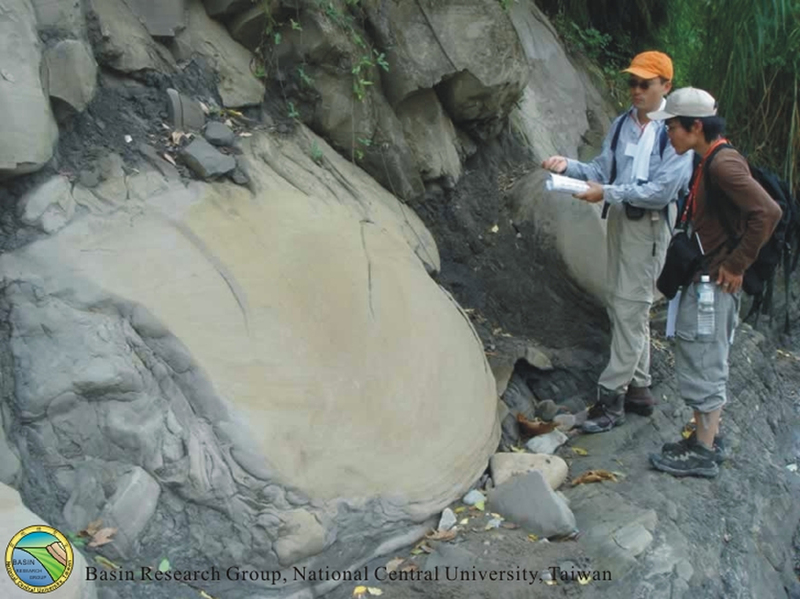 The stratigraphic section consists of the upper part of the Chinshui Shale, Cholan Formation, and Toukoshan Formation, representing a shallowing and coarsening-upward depositional cycle of the Taiwan foreland basin. According to Chen et al. 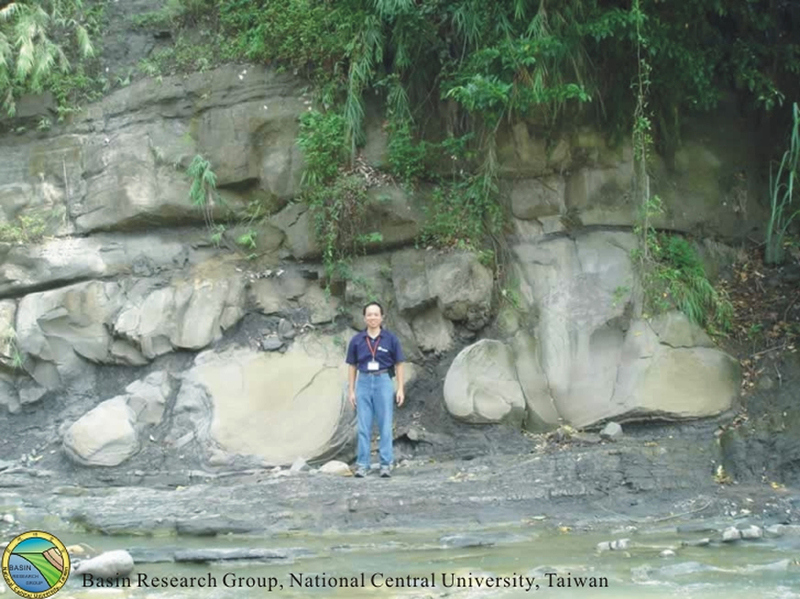 (2001), small-scale stratigraphic packages ranging from 20 to 150 m thick in north-central Taiwan consist of a lower lithofacies of interbedded mudstone and sandstone, a middle lithofacies of thickly bedded planar and trough cross-stratified sandstone, and an upper lithofacies consisting of ripple-laminated sandstone and mudstone. The lower lithofacies consists of tabular sandstone interbedded with mudstone that contains abundant foraminifera and nannoplankton microfossils. Individual sandstone beds are 50 cm to 1 m thick (Fig. 3A), are highly bioturbated (Fig. 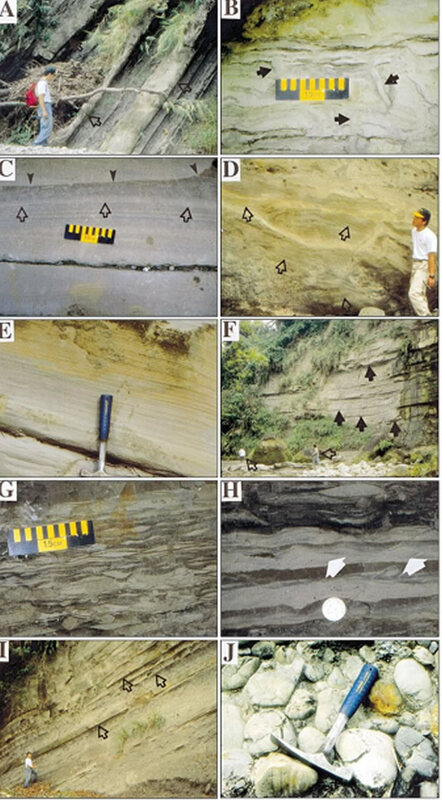 3B), contain hummocky cross-stratification (Fig. 3C), and have well-defined scour surfaces (Fig. 3C). Common trace fossils in this lithofacies include Planolites isp., Ophiomorpha isp., Paleophycus isp., Teichichnus isp. and Scolicia isp. Chen et al. (2001) interpreted this lithofacies as lower and upper offshore marine storm beds. 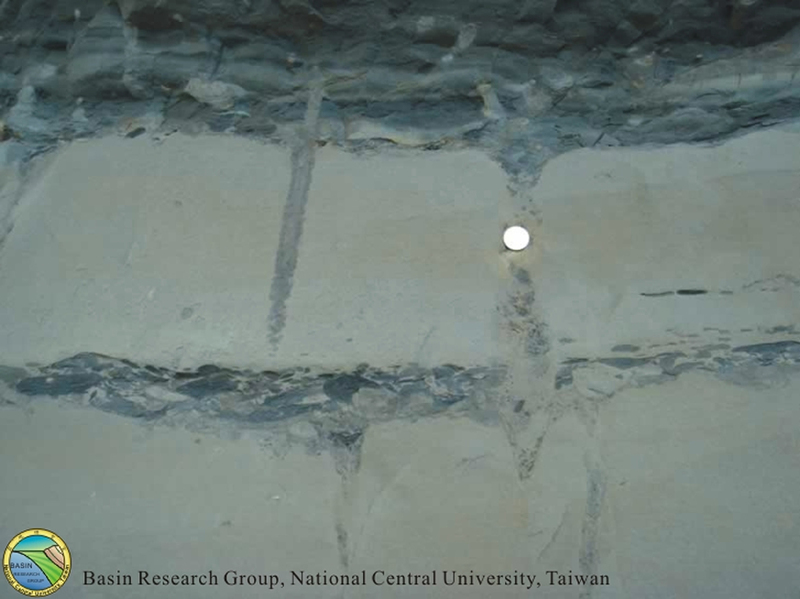 The storm beds grade upward into planar and trough cross-stratified sandstone (Fig. 3D) and horizontally stratified sandstone (Fig. 3E) of the middle lithofacies. 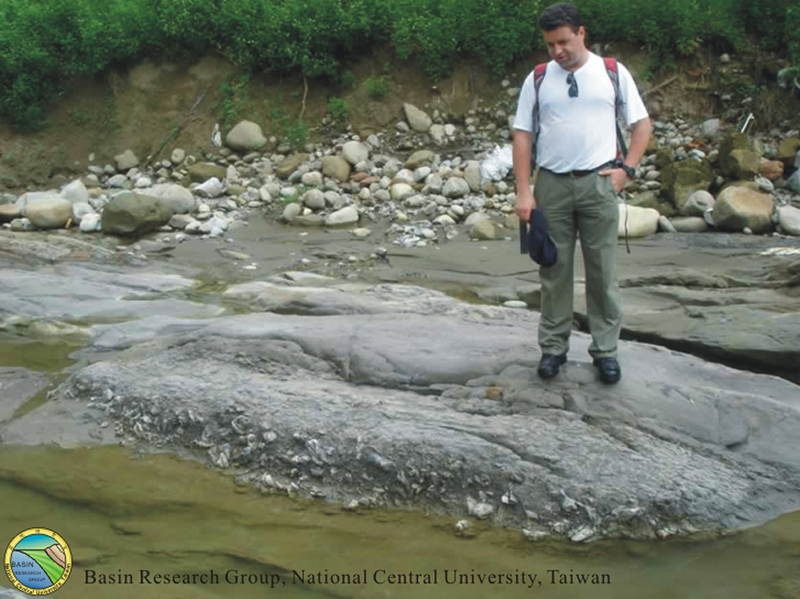 These sandstone beds are tabular at outcrop scale and may be up to 10 m thick (Fig. 3F). Trace fossils common to the middle lithofacies include Ophiomorpha isp. and Skolithos isp. 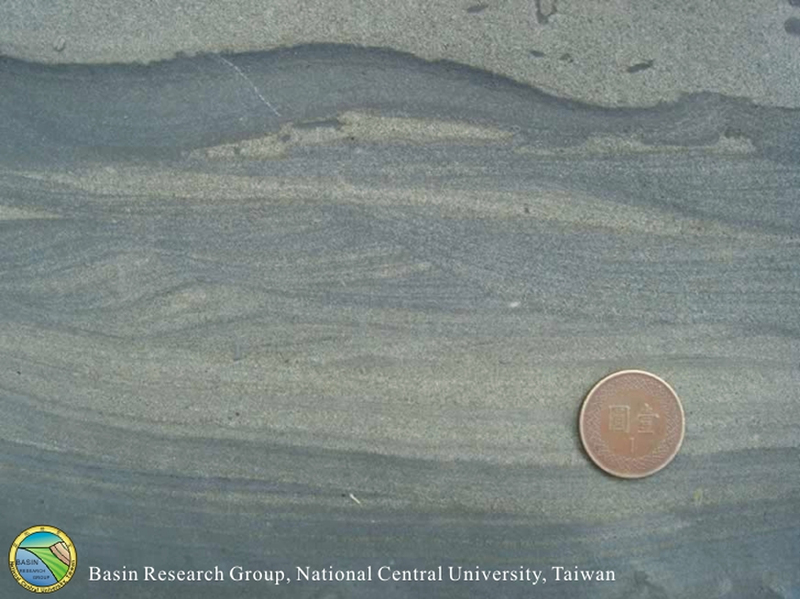 These strata are interpreted as nearshore marine sandstones that formed above storm wave base by Chen et al. (2001). 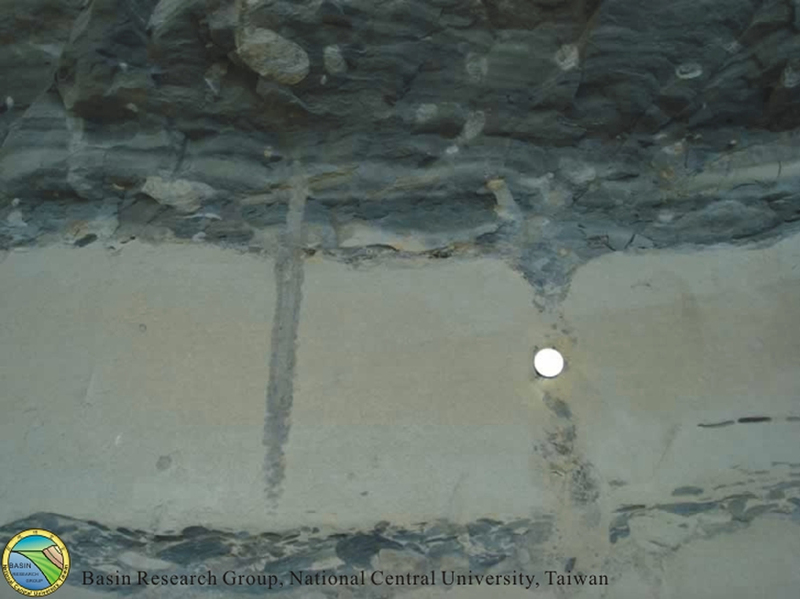 The nearshore sandstone component of individual small-scale stratigraphic packages increases up-section (Fig. 2). Overlying the nearshore sandstone lithofacies are laminated sandstone and mudstone (Fig. 2). This lithofacies contains flaser and wavy bedding (Fig. 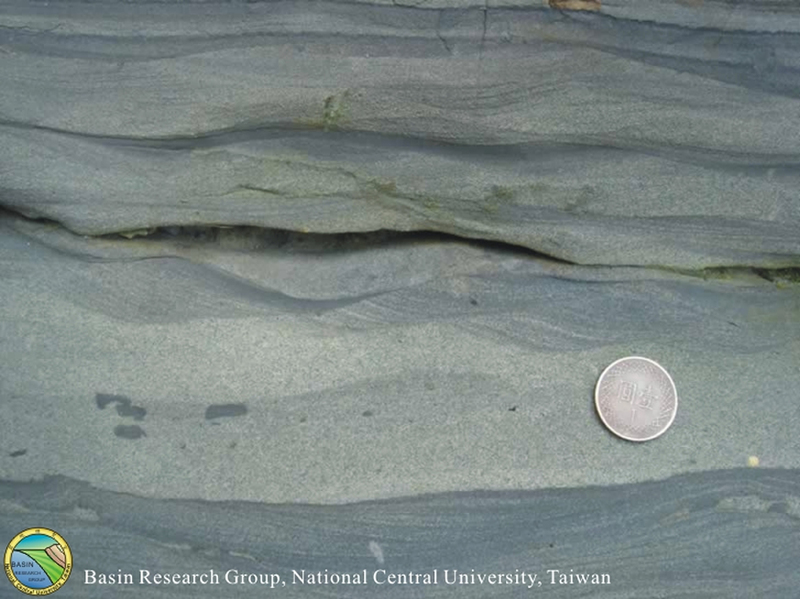 3G), mud-draped ripple foresets (Fig. 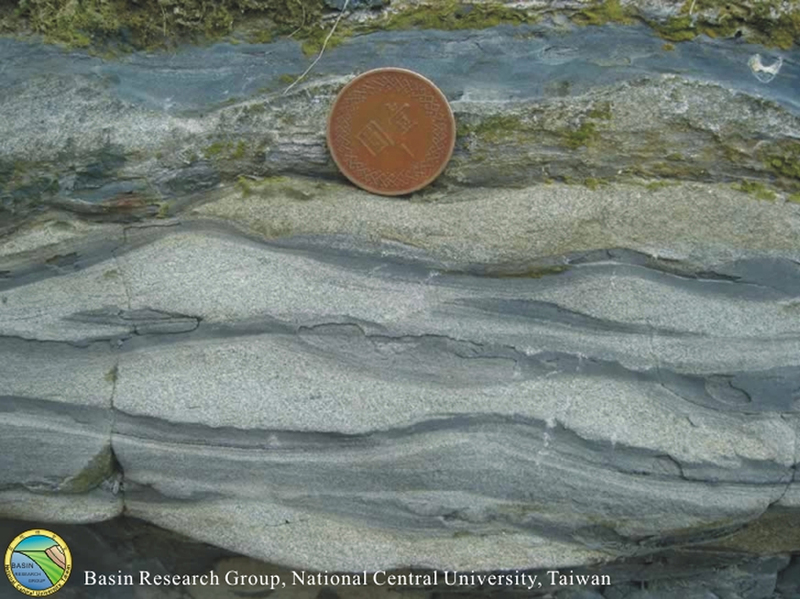 3H), and thin (< 50 cm), broadly lenticular sandstone channels (Fig. 3I). 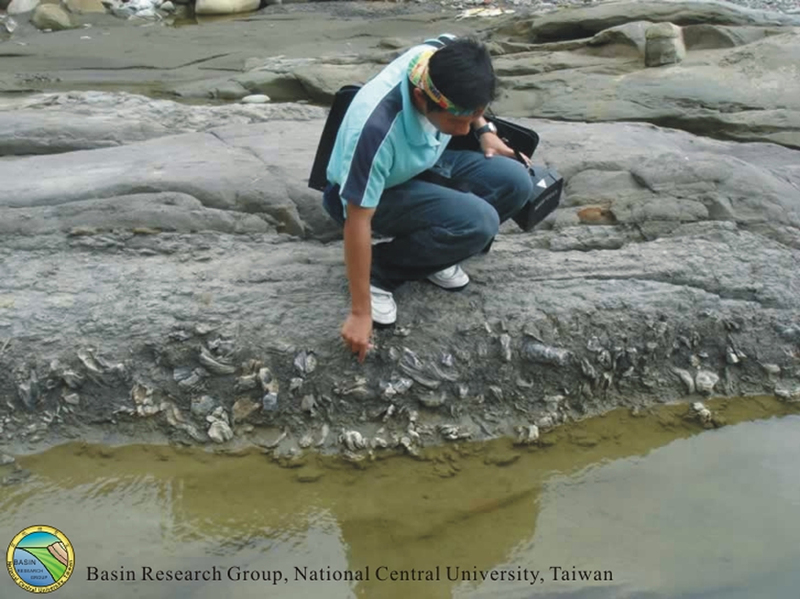 This lithofacies is interpreted as the product of deposition in tidal-flat and estuarine environments (Chen et al., 2001). 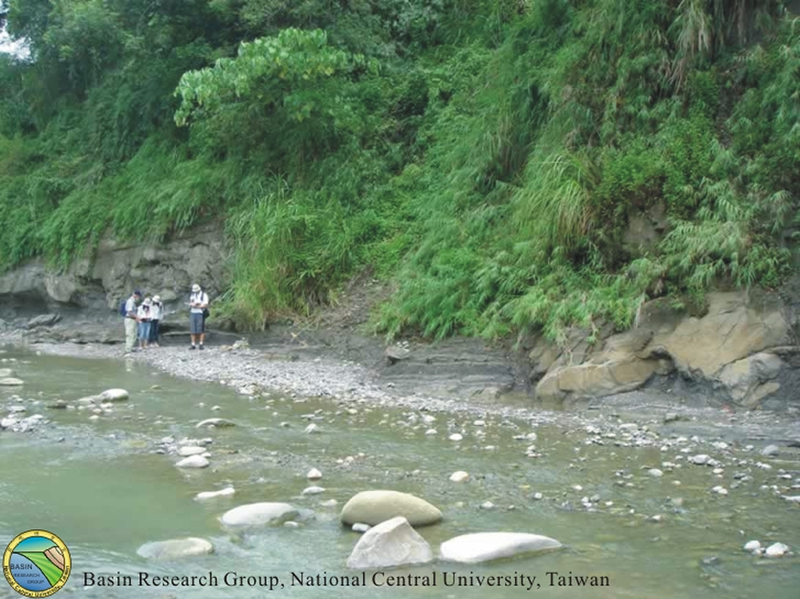 In the uppermost part of the Tsaohu River measured section (Toukoshan Formation of Fig. 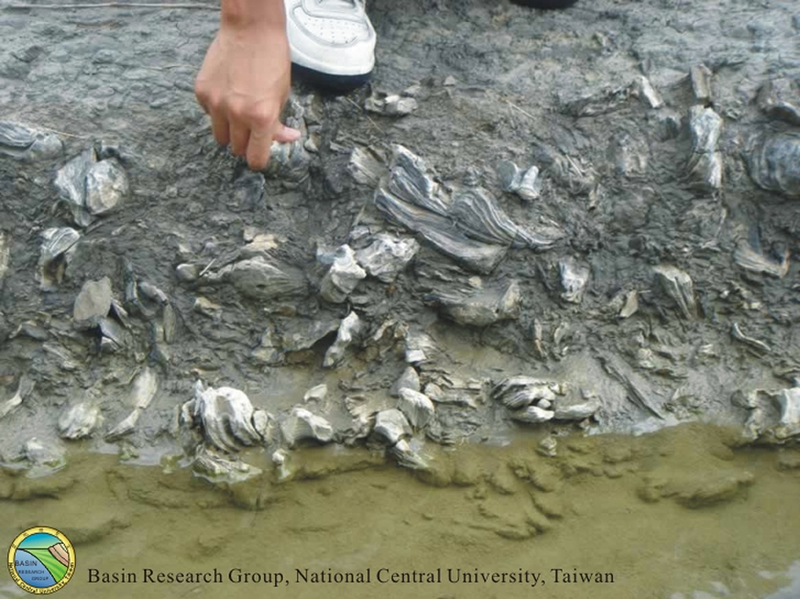 2), the estuarine deposits are overlain by clast-supported, well organized conglomerates (Fig. 3J), which become more abundant up section (Fig. 2). Finer-grained interbeds within the conglomerate contain nonmarine megaflora and fossilized teeth, bones, and horns of elephant, deer, and rhinoceros. 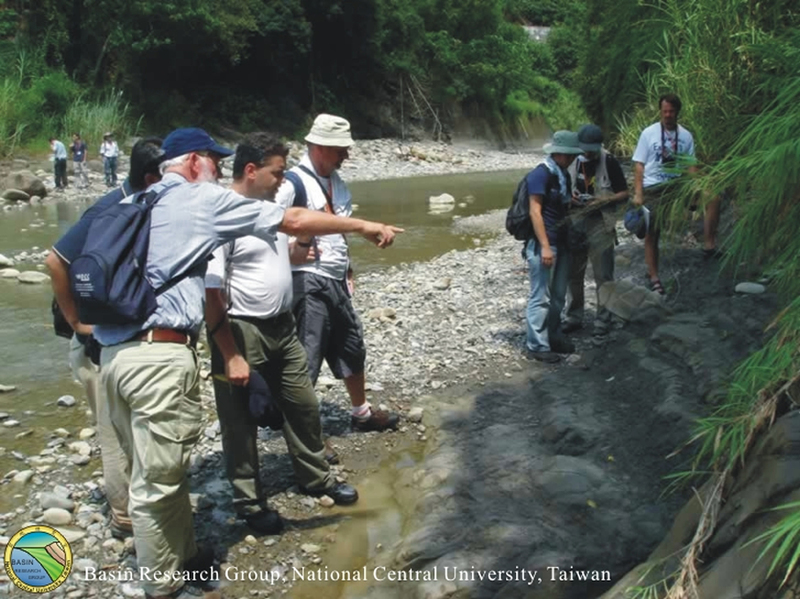 These channelized conglomerates are interpreted as braided stream and stream-dominated alluvial fan deposits (Chen et al., 2001). 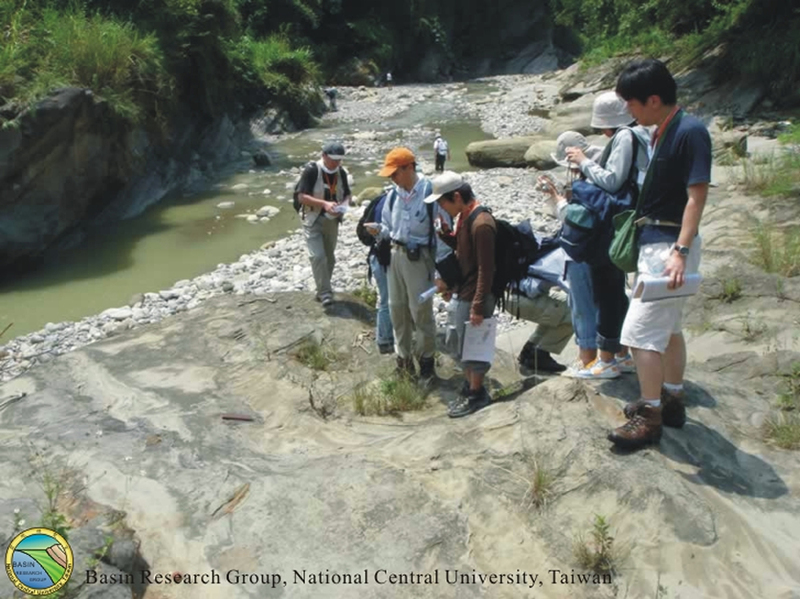 Geologic and topographic map near Wufeng township and to the east of the Chelungpu fault, central Taiwan (courtesy of Yang, C.-C.; modified from Yang, 1997). 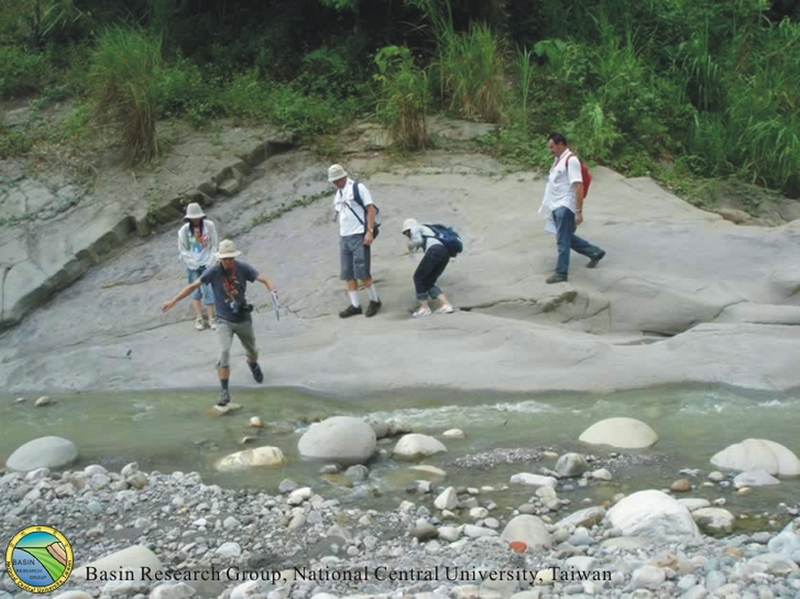 The Chichi ruptures (or Chelungpu fault) are shown in red lines, which follow closely along the foot of the hills and lie in the Chinshui Shale (Pcs). 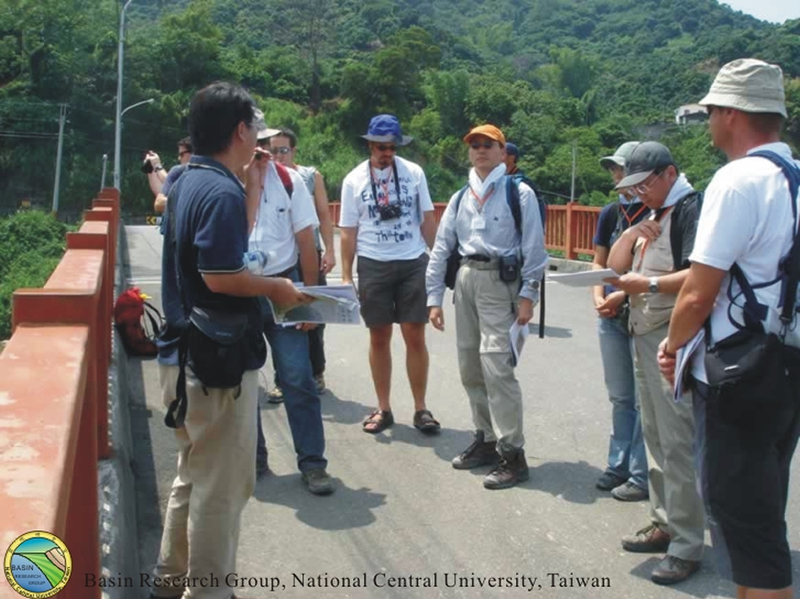 Stop A to C mark sites of outcrops along the Tsaohu River to be visited during the field trip. 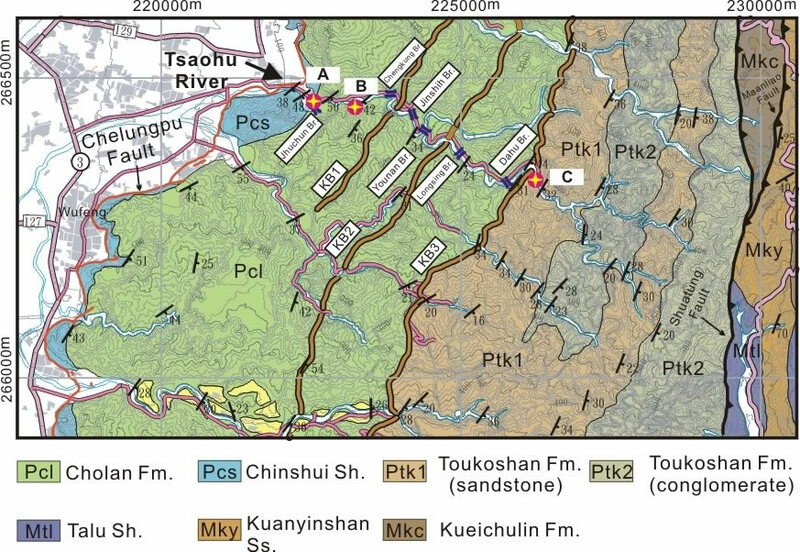 KB1~3 are thick, regional sandstone beds, which are labeled in Fig. 2 on the left of the stratigraphic column. 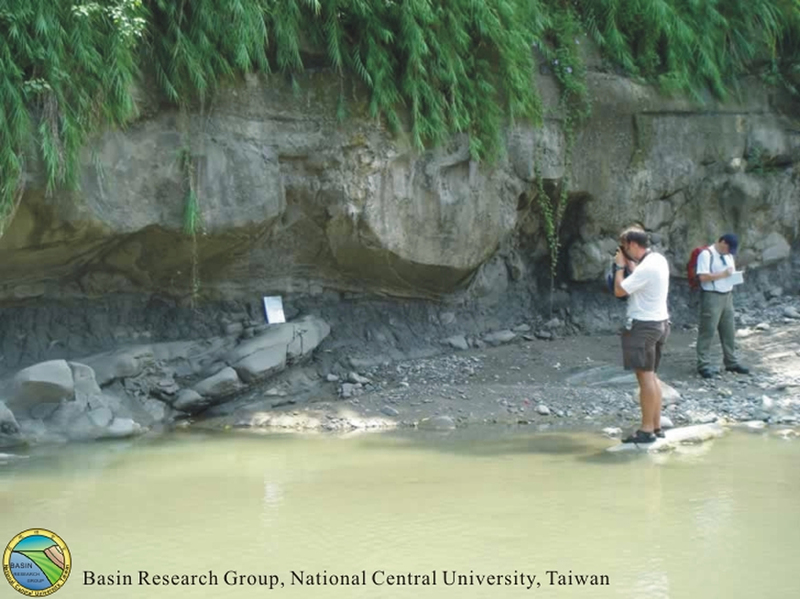 Stratigraphic column measured along the Tsaohu River (courtesy of Yang, C.-C.; modified from Chen et al., 2001). Lithofacies and interpreted depositional environments are shown alongside the column. Rose diagrams show paleocurrent directions. Red circles show the stratigraphic sections to be visited during the trip. KB1~KB3 are regional sandstone marker beds with their geographic distributions shown in Fig. 1. 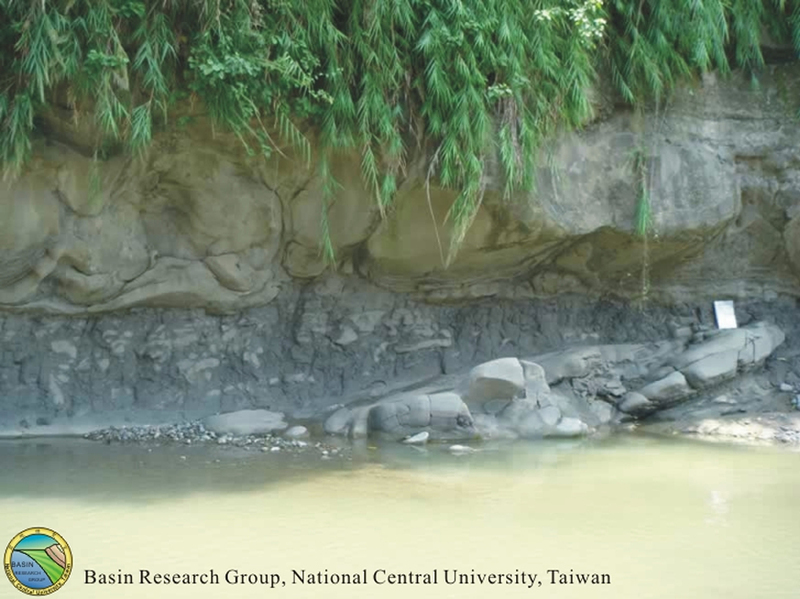 Lithofacies of Pliocene-Pleistocene foreland basin deposits exposed along the Tsaohu River, north-central Taiwan (after Chen et al., 2001). (A) Lower lithofacies of tabular sandstone interbedded with mudstone. Arrows point toward bases of individual sandstone beds. (B) Extensive bioturbation common in proximal storm beds. Arrows point toward well-developed burrows of Thalassinoides isp. 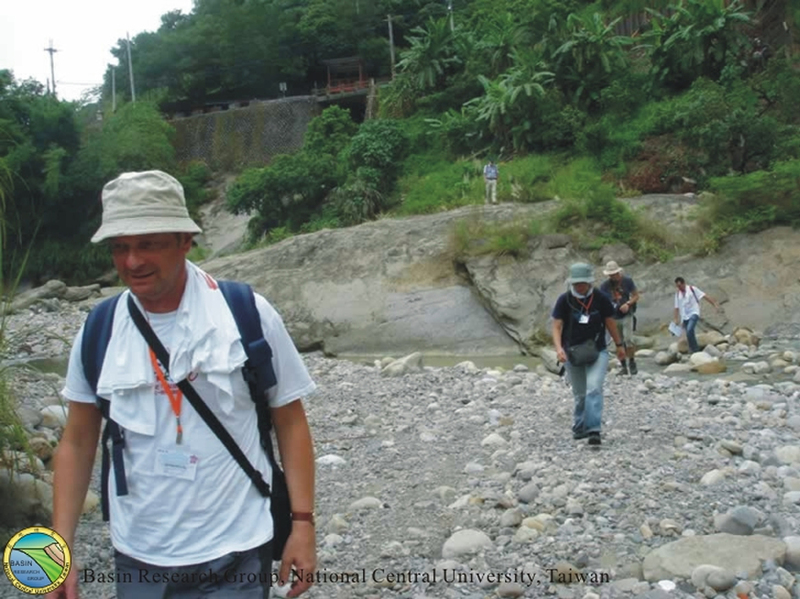 (C) Hummocky cross-stratification of proximal storm beds. Open arrows point toward a convex-upward stratification surface. Solid arrows point toward a well-defined scour surface typical of the proximal storm beds. 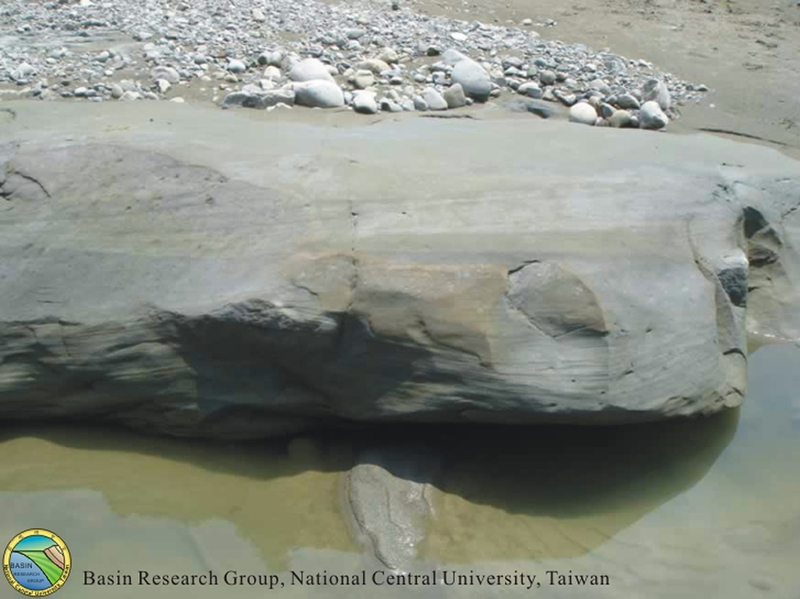 (D) Trough cross-stratified sandstone of middle lithofacies interpreted as nearshore sandstone. Arrows point toward well-defined limbs of trough cross-stratification. (E) Horizontal stratification of nearshore sandstone. The hammer is 28 cm long. (F) Thick-bedded, tabular sandstones of the middle lithofacies. Solid arrows point toward the base of individual sandstones. Open black arrows point to people for scale. (G) Wavy and flaser bedding characteristic of the upper lithofacies that we interpret as having been deposited in tidal-flat and estuarine environments. (H) Ripple stratification common in upper lithofacies. Arrows point toward mud-draped ripple foresets. The coin is 20 mm in diameter. (I) Thin, broad, lenticular channels interbedded with ripple-laminated sandstone and mudstone of upper lithofacies. Arrows point toward base of individual sandstone beds. Bedding dips to left. Person in lower left for scale. 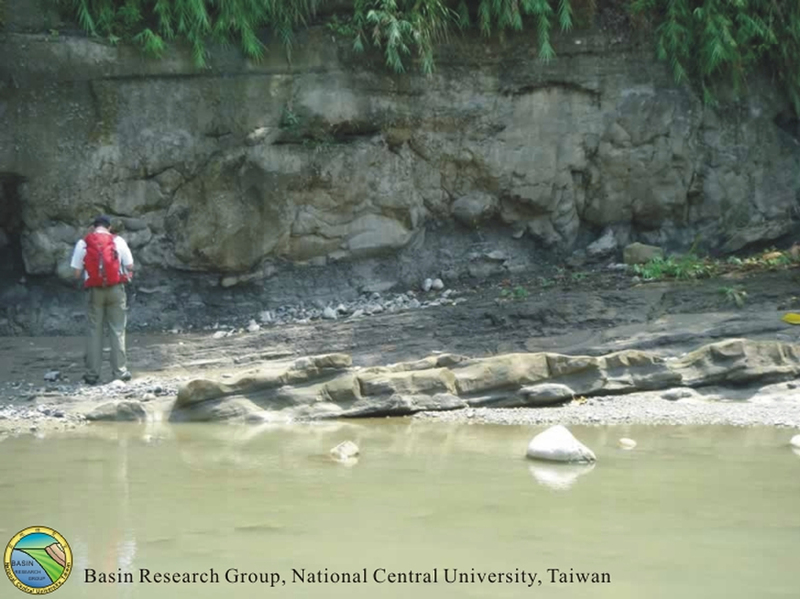 (J) Clast-supported, well-organized fluvial conglomerate common in the upper part of our measured section from north-central Taiwan.